Scotch Lamb sales were up 20% between August and October thanks to efforts to get shoppers to buy and cook more Scottish lamb. Red meat levy body Quality Meat Scotland (QMS), which oversees and promotes the Scotch Lamb brand, said a nine-week promotional campaign had generated impressive results. The campaign – Scotch Lamb Naturally – resulted in a 27% increase in spend per buyer on Scottish lamb, and a 20% increase in the volume purchased per buyer in the 12-week period to November 4. QMS said a TV advert, partly financed by a £200,000 grant from the Scottish Government announced by First Minister Nicola Sturgeon at the Turriff Show, had been a major driver behind the sales boost. It said a key focus of the campaign had been to raise awareness of Scotch Lamb as a simple, quick mid-week meal, and independent consumer tracking before and after the campaign showed positive results. There was an 11-point increase in the number of people who viewed lamb as quick and easy to cook with – up to 70% from 59% before – and a 9% increase in those willing to pay more for Scotch Lamb. “Our sincere thanks to all those who helped and supported us with the Scotch Lamb campaign this year,” said QMS director of marketing and communications Carol McLaren. 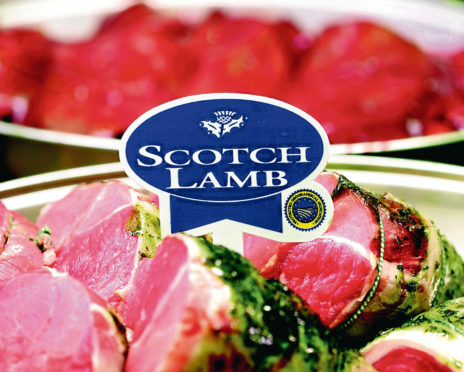 Throughout the campaign farmers and others involved in the production and retail of Scotch Lamb got involved in the campaign as Scotch Lamb champions, or “Lambassadors”. Their promotional efforts included sampling sessions at Aldi and Morrisons supermarkets where more than 16,000 samples of Scotch Lamb were handed out to shoppers.